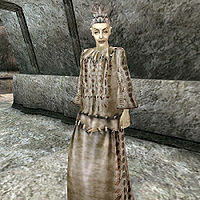 Sirilonwe is an Altmer nightblade found in the Vivec Guild of Mages, which is located in the Foreign Quarter plaza. Steal Chimarvamidium: You are asked to 'borrow' a book from the Vivec Guild hall. Return Chimarvamidium: Return the book you 'borrowed' from the Vivec Guild hall. Shashev's Key: Kill this rival mage for Sirilonwe in Vivec. Dust of the Vampire: Find three portions of vampire dust for Sirilonwe in Vivec. "Why, I've never heard of such a book..."
"How did you... I mean where did you get a copy of Chimarvamidium? I've been looking for this book. Perhaps you'd be willing to part with it?" Give her the book. : "Thank you. I won't forget this. Just a suggestion... Keep quiet about this book, %PCName. Some members of the Mages Guild can be very jealous." Keep the book. : [Disposition -10] "That is most unfortunate, %PCRank. I thought you would be willing to assist a fellow Guild member." latest rumors: "The Dark Brotherhood is ready to make their move on the Morag Tong. I hear the Night Mother herself has come to Vvardenfell." Trebonius: "I don't care what he asked you to do. The best thing for all of us is to ignore that Scuttlehead. Last year he asked me to learn the language of the Silt Striders so we could question them about who they took to different cities."